MeetingPackage.com, the global marketplace for booking off-site meetings & events, announces that it will enable, as the first marketplace in the world, direct integration to Oracle’s Opera Sales & Catering. Oracle’s system is widely used by hotels around the world. The first hotels have already started the integration process, and the users of MeetingPackage.com can soon book their offsite meeting spaces directly online with transparent pricing and availability. “We are really proud and enthusiastic about finalizing the integration with Oracle’s Opera Sales & Catering, a process that we already started years ago. We strongly believe the meeting booking market is moving towards greater transparency and less friction in customer transactions. In other words, the availability of meeting spaces will be ‘genuinely online’. This development is beautifully in line with our own vision for 2020, when we believe the majority of meeting room bookings will be made through MeetingPackage.com and the venues directly”, says Joonas Ahola, CEO and Founder of MeetingPackage.com. “Plus, quite frankly, it’s pretty cool that a Finnish startup company achieves this ahead of the established global booking platforms”, Ahola smiles. "We are continuously exploring new ways to boost our revenues. Our guests and meeting bookers are online but as an industry we haven´t been able to offer the option of booking meetings and events online and in real time. We are happy to hear that MeetingPackage.com have been able to develop that functionality and we are eager to further explore this opportunity with them", says Christian Borg, Commercial Director at Scandic Hotels Finland. 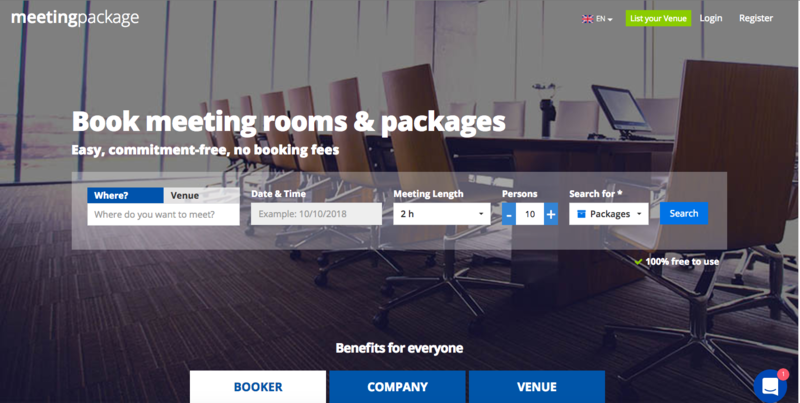 MeetingPackage.com also offers its platform as a white label product for the online players in the travel market to help their customers to book meeting rooms online. Convention Bureaus, TMCs and blog websites have already implemented this solution. Carlson Wagonlit Travel is one of the TMCs using the technology provided by MeetingPackage.com in the Nordics and Italy to offer their customers the possibility to book meeting rooms online. Hotels themselves can also utilize the new integration by implementing the white label booking engine on their own website. “We have been partnering with MeetingPackage.com both through the marketplace and recently also by implementing the white label booking engine on our own website. An independent hotel like us must work hard to find new ways to offer our customers state-of-the art services and solutions. We want to differentiate with our service offering, including the latest digital solutions”, says Päivi Laine, CEO at Hotel Haaga Central Park. The CEO of MeetingPackage.com is Joonas Ahola, and the company has offices in Espoo, Finland, London, UK and Monza, Italy.